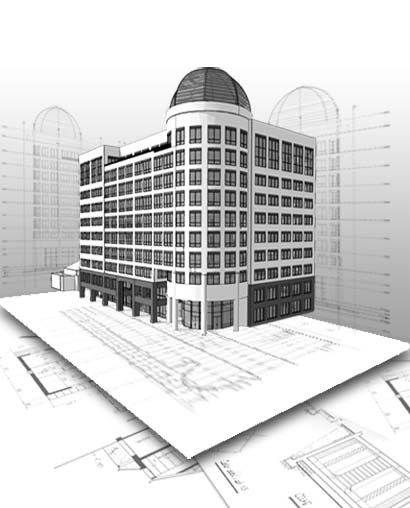 From the 3D model, ENGworks’ skilled team of architects, engineers, and modelers are able to accurately and efficiently generate a high quality set of Permit, Construction, and/or Fabrication plans, taking advantage of the true BIM parametric efficiencies. ENGworks fully engages with its clients throughout the entire design process, becoming an extension of the client’s production teams. In addition to specific modeling standards, we have established extensive Quality Control and Quality Assurance verifications for all of our ENGworks projects. We provide all pertinent information for the construction project by developing and maintaining the project’s geometry, spatial relationship quantities, geographic information, and component properties. ENGworks’ construction documentation services are designed to help architects, engineers, and contractors to maintain quality and turn around in their construction documentation sets. Building Services documentation also includes Shop/Fabrication Drawings, MEP Documentation, Structural Drafting, and Record (As-Built) Documentation. We have experts in Revit®, AutoCAD®, Bentley, Navisworks®, Tekla, ArchiCAD, Google Sketch up, and other BIM platforms for any method of production. To further assist you, we can assign one or more of our BIM professionals to your design team for the duration of your project. Our BIM professionals will help in your office or in the field (On-Site Support), while the rest of the team at ENGworks guides you from our offices.